The word gynandromorph comes from the greek: gyne means female, andros means male and morph means form. A gynandromorph is an animal that are divided half female and half male, they have organs of both sexes and offen haves characteristic of sexual dimorphism like colour/patterns-differences, and differences of antennas, wings, claws and horns. Gynandromorphs has nothing to do about hermafrodism - It´s an rare genetic abnormality that appears in insects, arachnids and crayfishes. Often gynandromorphs cant function as females nor males, and cant reproduce. But there is a case of a lobster, where the female produced a half batch of eggs. The lobster lost the eggs but a group of scientist managed to save a few that later developed to fully functional animals. More cases of gynandromorphs have been found in butterflies, jungle nymphs - Heteropteryx dilatata, leafs insects - Phyllium bioculatum, hissing cockroach - Gromphadorhina portentosa, beetles - Mecynorhina polyphemus confluens, grasshopper - Tropidacris collaris. And now to the most interesting... Spiders! 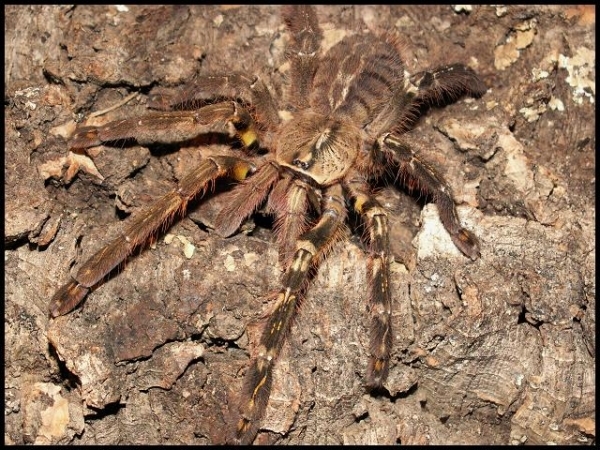 It´s also had been found in wolfspider - Alopecosa pulverulenta. Two matings with one female has been noticed, it´s laying an eggsack, but unfortunately the eggs dosn´t develop. Both dorsal and ventral side has characteristic of sexual dimorphism, I also checked the ventral side of the abdomen, and here the epigastric furrow was a little bit sloping and has different thickness. The female-sides furrow was more white and opened, while the male-sides furrow was smaller and closed. Unfortunately I dosn´t got any good pictures of this. Here I took the upper picture and split the spider upp in half, copied and turn the respective sides reversed to show how clear and obvious the sexual dimorphism are in Poecilotheria ornata as the are well-known as.